Unlike 2018's other Foreign Language nominees, "The Insult" has real political power—to help its homeland heal from the past. Full disclosure: I am neither Lebanese nor an expert in Lebanese history. However, I’ve seen how films can be both catalysts and reflections of transitional justice outside the Middle East. This interest— in movies as a mechanism for national reconciliation—led me to The Insult, Lebanon’s first-ever Foreign Language Oscar nominee. Oftentimes, an Oscar win means some actor, director, or production company gets to feel better about themselves. The Insult is different. It grabs Lebanon’s tumultuous history by the horns, granting the film political power that none of this year’s other Best Foreign Language Film nominees possess. I want The Insult to win an Oscar because such a victory will mean so much more than self-adulation—it’ll create breathing room and offer legitimization for Lebanese who wish to come to terms with their country’s past. Lebanon is a beautiful Mediterranean nation with complex sectarian issues. Christians, Sunni Muslims, Shia Muslims, Palestinian refugees, and Druze all call Lebanon home. This volatile sectarian mix led Lebanon to experience a civil war from 1975-1990, resulting in the deaths of over 120,000 people. During the war, alliances constantly shifted and interventions from Israel and Syria further complicated loyalties. The war saw no clear victor, and its underlying sectarian tensions remain unresolved. Schools in Lebanon avoid teaching the Civil War, because nobody agrees who’s at fault. As a result, Lebanon continues to experience periodic flare-ups of sectarian conflict to this day. Enter The Insult. The film centers around a dispute between a Lebanese Christian named Tony and a Palestinian refugee named Yasser. After an argument over a drainpipe, Tony insults Yasser by saying that he wishes Ariel Sharon (the defense minister who led Israel’s 1982 invasion of Lebanon) wiped out all Palestinians. In response, Yasser punches Tony in the ribs. Tony takes Yasser to court, and the ensuing case ignites tensions between Lebanon’s various Christian and Muslim communities. Yes, there are already some films that depict Lebanon’s Civil War. However, The Insult is the first movie that directly exhorts viewers to examine the war’s legacy. Through the creative format of a courtroom drama, the film provides a microcosmic template for open dialog and transitional justice. 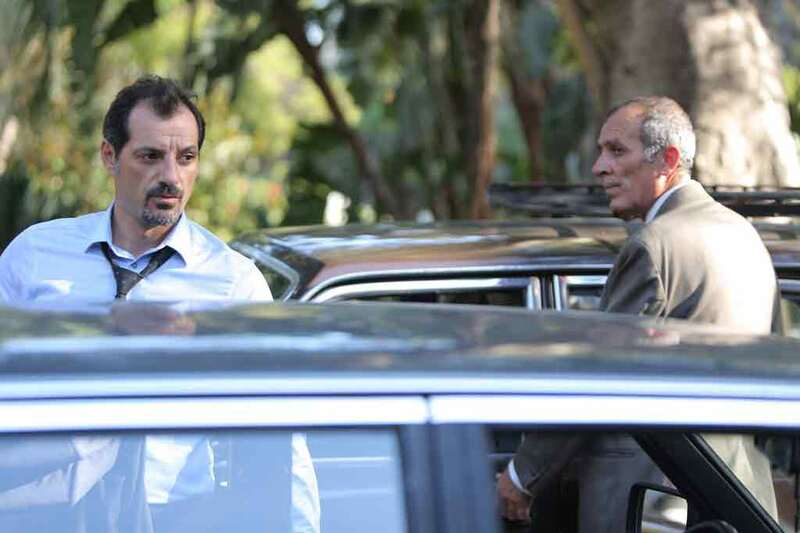 As Tony and Yasser proceed through the trial, their lawyers bring up sensitive topics from the past— the 1976 Damour massacre, Christian phalangist leader Bashir Gemayel, the Black September conflict, and so forth. There’s a clear subtext: having frank discussions that hold the past to account is painful, but ultimately necessary if Lebanon wants a brighter future. This is an expression of dismay rather than dissent. In The Insult, Lebanon’s onscreen President and “Christian Party leader” both encourage Tony and Yasser to “turn the page” and reconcile. Good luck seeing that happen in real life. What’s the power of an Oscar? In short: an Oscar for The Insult may help fulfill that duty Doueiri talks about. For better or for worse, an Oscar win creates buzz. In The Insult‘s case, I hope it’ll be for the better. If the film wins an Oscar, more people in Lebanon will talk about it—and by extension the issues it represents. There’ll be an inclination to at least ask “what’s this award-winning movie about”, which will naturally lead to conversations regarding Lebanon’s lack of national reconciliation. Honestly, The Insult seems perfectly primed to take advantage of Oscar-generated buzz. In a meta sense, it’s a movie whose characters have a heated but productive discussion about Lebanon’s past, whose success may lead Lebanese to have more heated but productive discussions about their country’s past. Even getting nominated for an Oscar has helped The Insult spark conversations regarding Lebanon’s political climate. Take for example this parody poster I stumbled upon, created by a Lebanese journalist on Twitter. The poster replaces The Insult‘s two protagonists with Nabih Berri and Gibran Bassil, Lebanon’s Speaker of Parliament and Foreign Minister, respectively. Bassil (a Christian) recently called Berri (a Shia Muslim) a thug—deepening an already extant rift between Lebanon’s main Christian and Shia factions. While this tweet didn’t necessarily become viral, it’s an example of the kind of political discussion that The Insult could further spark with an Oscar win. Here, someone in Lebanon is comparing their world with the one presented in The Insult—and that’s something I’m sure director Doueiri wanted audiences to do more of. An Oscar win is also something that gets politicians to pay attention. Take for example Argentina, whose two Foreign Language Oscar winners (The Official Story and The Secret in their Eyes) both touch upon the country’s 1974-1983 “Dirty War”. When The Secret in their Eyes won its 2010 Oscar, Argentine President Cristina Fernandez de Kirchner lauded the film as “fantastic” and having “an impact” on her, using it as a reason to stimulate domestic film production. That said—Argentina does provide an intriguing model for Lebanon to follow. While Argentina is by no means perfect, it’s held its past to account far more than Lebanon has; vigorous agitation from civil society groups has spurred hundreds of prosecutions against Dirty War perpetrators. Furthermore, you could argue 1985’s The Official Story is an Argentine analog to The Insult, as the first internationally recognized movie to grapple with a recent conflict in its homeland. While The Official Story‘s Oscar win didn’t magically change Argentina overnight, it guaranteed that both Argentines and foreigners would keep talking about the issues the film presented. The Official Story set a precedent, signaling that it was OK to discuss, and make even more movies about, the Dirty War—creating a virtuous cycle of national dialog. The Insult is already a powerful film. Using Ziad Doueiri’s parlance, an Oscar win might just provide a vaccine against Lebanon’s “general amnesia” and open the door towards further national healing. Of course, I’d be overly naive to say that all this is guaranteed to happen if The Insult wins an Oscar. However, more than any other Best Foreign Language Film nominee this year, The Insult has the potential to spark a sea of change. It provides a rare chance for an Oscar to actually inject some hope into the world instead of stroking someone’s ego—so I hope the Academy of Motion Picture Arts and Sciences chooses wisely. The Insult is currently screening across select North American theaters.